I ventured off to Balham last week, as a guest at The Supper Club London, where I was greeted with a glass of Codorniu sparkling wine and a warm welcome from the host, John. He and his lovely assistant busied themselves in the kitchen as the guests all got acquainted over their fizz. Before long we sat down for dinner and I was lucky to share a table with four really fun diners, including two Greeks, an Italian and a Welsh St Lucian. It was a continental laugh-a-minute! 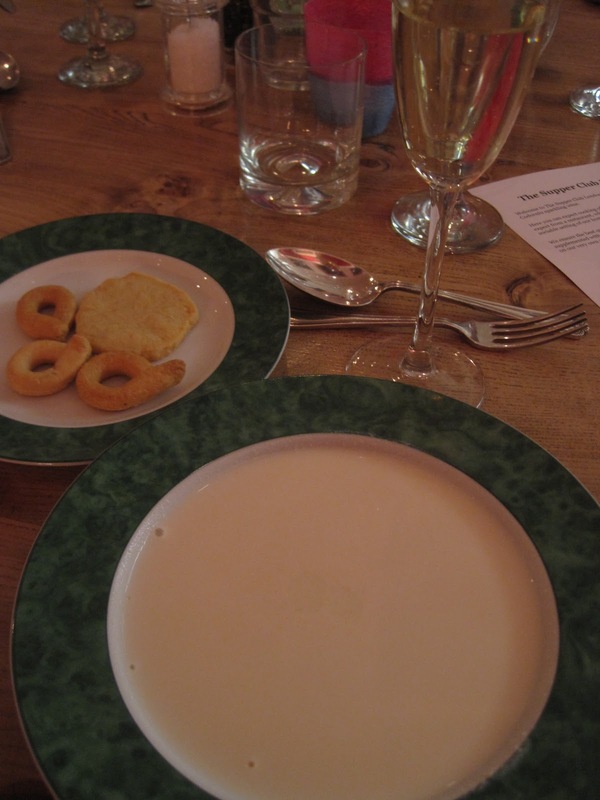 The starter was a cream of cauliflower soup which was certainly creamy and came with a plate of homemade savoury biscuits. However, it was rather lacking in presentation and just a bit bland, but nothing a sprinkle of croutons, a sprig of garnish and a hint of seasoning couldn't put right. Next came the main course of game pie with seasonal vegetables. More of a stew than a pie really, the meat was a medley of tender venison, rabbit and pheasant in an interesting orange-infused gravy all topped off with a perfectly baked individual pastry crust to give it the 'pie' touch. Personally, I'm not a big fan of celeriac or pearl barley, so the pale soft side dishes really didn't appeal to me, although the mange tout and green beans did add some necessary colour and crunch to the dish. Meanwhile, the wine, wit, company and conversation continued to flow at such a great pace, that even Splodge the Cat decided to join in! The piece de resistance was the pudding. Pears poached in Sauterne with homemade chocolate ice cream. I think poached pears must be the Pud du Jour as they've popped up at several supper clubs I've been to of late. But this was unique as it came with some very impressive sugar work - delicate thin caramelised sugar legs gently leaning against the pear as it nestled in a pool of seriously good chocolate. As a lecturer by day, John enjoys using his spare time to pursue his interest in cooking, hence The Supper Club London. He really was a great host and you can tell he thoroughly enjoys orchestrating his supper evenings, putting his all into it. Despite the fact that some of the dishes weren't necessarily to my taste (and not forgetting it is a supper club, not a restaurant) on a culinary note, I would say the food offered is good, wholesome, home-cooked grub. I especially like the fact that the vegetables and herbs are grown in John's nearby allotment - a nice personal touch. Whilst some supper clubs charge absurd amounts for a fairly mediocre meal, and others are perhaps justified in charging more due to their exceptional, almost professional chef quality type meal, John has got it just right by charging a reasonable £20 per head for a respectable 3 course dinner. It was a happy, relaxed and most enjoyable evening and due to the excellent company, it carried on very late into the Balham night. 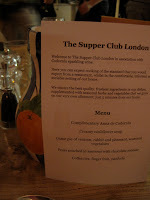 There are various dates coming up at The Supper Club London, so check the website to make a booking. Just add wine!